Here it is! My 1st magazine feature! 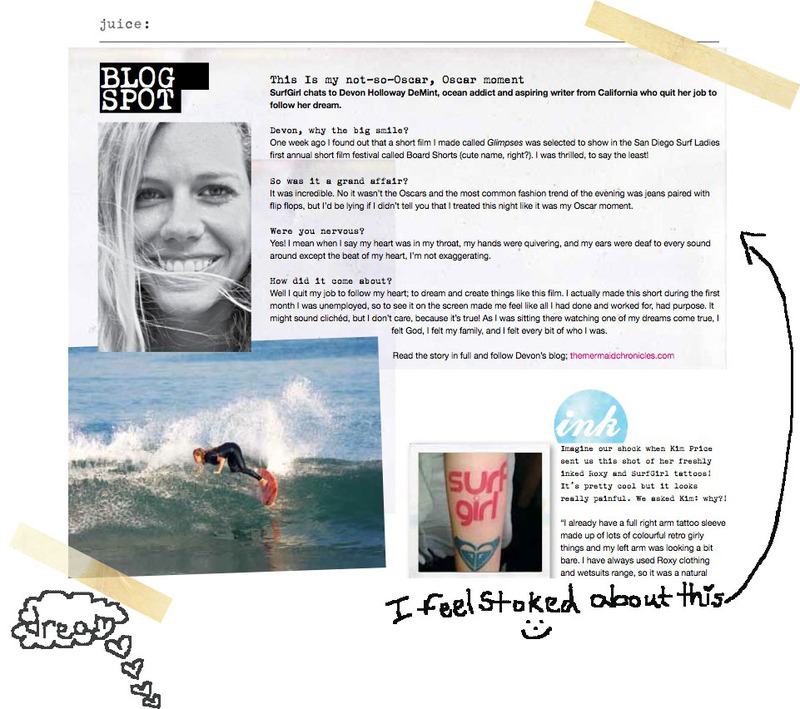 You can imagine my surprise when I opened the recent issue of Surf Girl and saw that… it wasn’t in there. Well, I’m that dummy who missed the very first time they were published. Yes, I missed it. This interview was published in February and I didn’t know it. I didn’t buy it. I subscribed too late. Fortunately, the editor was nice and, although the issue sold out, she sent me a PDF of the interview. You can click on it to see it larger, if you like. so sad you missed it! i hope the pdf file will cheer you up. and…congrats for your publication!!! Awww, you missed it?! Haha! Oh, Devon! At least they sent you this PDF! Congratulations again! SO exciting!!! Congratulations. Also, if I was in a mag, I would have missed it also. That is so awesome. I am LOVING the tattoo. So you. Congrats on the amazing opportunity, im sure there are many more headed your way girl! What a lovely feature! Did you have a big spike in your blog traffic in Feb that you couldn't understand? Omg that's AMAZEBALLS! You are an inspiration to females everywhere! Devie! Congratulations, I'm so proud of you!